Call for Wheelchair Transportation Service! 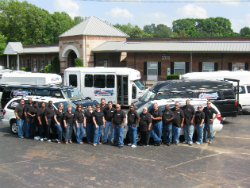 CJ Medical Transportation is a medical transportation company headquartered in Greensboro, NC. 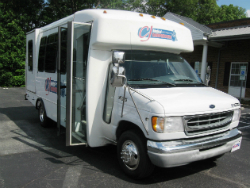 We are able to provide handicapped transportation to and from any location within the area. Our staff consists of highly-trained dispatchers, billing staff, customer service representatives and drivers to assist you. Our fleet has over forty vehicles, making us the Triad’s largest medical specialty provider. We’re proud to offer the best long distance medical transportation, serving Greensboro, NC and the surrounding areas. We provide transportation services for people with a wide variety of needs. Our clients include disabled and handicapped people, dialysis patients, stroke victims, cancer patients, and more. We provide ambulatory and wheelchair transportation service to medical and dental appointments, physical therapy, pulmonary and cardiac rehab, chemotherapy, and other services. We can provide long distance medical transportation and transportation to special events. Our goal is to provide the best service to clients in need of transportation. To make that happen, CJ Medical Transportation works closely with individuals, hospitals, insurance providers and long-term care facilities. We’ve created a foundation of excellent customer service. Our goal is to ensure that you receive high quality service at an affordable, cost-effective price. Ask us about long distance medical transportation. Each client deserves to receive the safest, highest quality medical transportation service in the Triad area. That is why we keep our Fleet of Vehicles spotlessly maintained. We’ve created strict maintenance procedures and enforce them. Our drivers are carefully selected and highly trained, including CPR certification and basic first aid training from the American Red Cross. 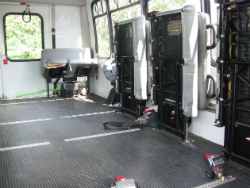 All wheelchair transportation service is provided using state-of-the-art wheelchair vans. Each of them comes with an ADA approved lift and/or ramp, plus heating and air conditioning systems designed to keep you in comfort. We intend this mode of transportation for clients who can sit up and do not believe they will need medical attention over the course of the trip. You can trust our drivers to load your wheelchair and make sure both you and the chair are properly secured. Are you able to walk on your own or with the aid of a walker? Our minivan transportation would be best for you. A driver can assist you to get into and out of the van. Once you’re inside, we can take you anywhere you desire: running errands, medical appointments, or to family and social events. CJ Medical Transportation specializes in wheelchair transportation service, handicapped transportation and long distance medical transportation. Each transport has a scheduled pick up time and the return trip is done on demand. We make scheduling a transport easy – you may give us a call or request an appointment online at our website. CJ Medical Transportation provides wheelchair, handicapped & non-emergency medical transport services in Greensboro, High Point, Burlington, Chapel Hill, Durham and Raleigh. From the Triad to the Triangle, you can count on CJ Medical Transportation for all your medical transport needs.